My friend and I often discuss: “What would you grab first if your house was on fire?” We both have favorite pictures worth saving, and of course, my wedding ring is at the top of the list. She has a memory book that is very important to her, and everyone in her family knows where it is and that they must “GRAB IT BEFORE ESCAPING!” Then we say, “Well, if there’s more time, then I would probably try to save…” I know that ultimately these things are just possessions, and in the end it’s not things that matter. Some people (other people) can be so free of things. Their houses are sparse and sleek. Well, that’s not me because, dang it, I like things! I gain pleasure from pretty pieces of pottery and lovely books. 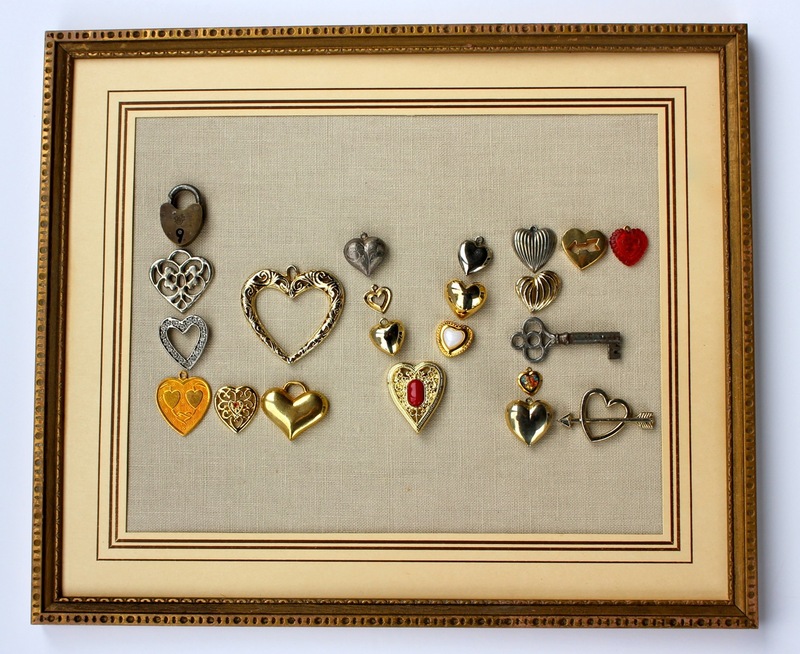 My heart sings when someone makes me a gift, or I find pretty vintage figurines or pieces of art at the thrift store. I seriously hope I never have a fire, but the good news is that most of the items I own, while probably irreplaceable, didn’t cost very much money. 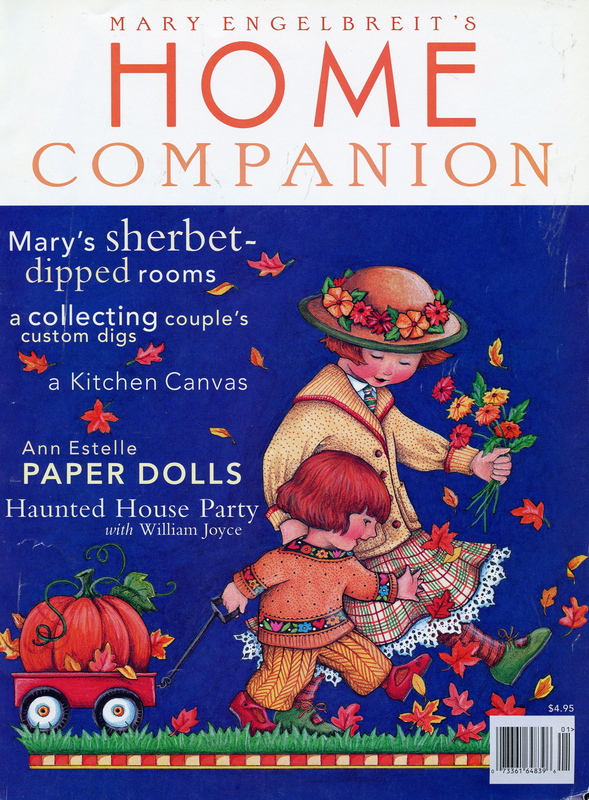 One “thing” that would definitely be hard to save in a hurry, but means an awful lot to me, is my collection of Mary Engelbreit Home Companion magazines. Years and years ago, still in the phase of my life where I moved from apartment to apartment, I started subscribing to the magazine. It was such a thrill to find it in my mailbox – like a special gift. I would wait until I had a good long time to sit down and savor it from cover to cover. 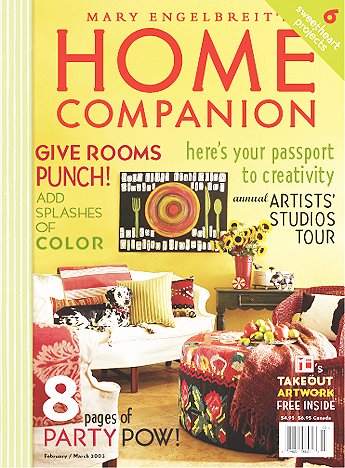 Well known for her colorful and light-hearted artwork, Mary lent her special touch to each beautiful issue. Each one was bursting with art and pictures of rooms and homes like the one I wanted to create. These people had collections, and books, and art and things! I pored over the pictures admiring the eclectic and whimsical decorating styles. I used sticky-notes to mark my favorite ideas, because I wouldn’t think of tearing out pages like I did with all of my other magazines. Then I decided to get online and try to find copies of all of the issues I didn’t own – the ones from the first few years of publication. It was like a treasure hunt, and it took me awhile, but I eventually completed my collection. Finding a copy of the first issue was especially hard, but I felt like I had won a marathon (obviously I don’t run) when I won the auction on Ebay. 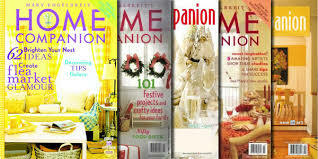 I have gotten many an idea, and created some of my most special artistic creations, with inspiration from these pages. I realize that Mary Engelbreit has moved on from publishing her magazine. Undoubtedly, the ones I have are such a special treasure. In case of fire, I will do my best to save them from the flames. 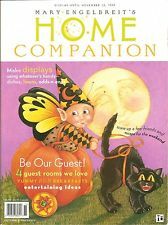 However, Mary, if you read this, just let me say, if you decide to start rolling the Home Companion off the presses again, I will be one of the first subscribers, and it will be my mission to write something for its pages.Of course, you can see what Mary is creating now on her lovely website. I stop by from time-to-time to see her latest art work, and I always love it! Just Us Spring Chickens (and ducks)! 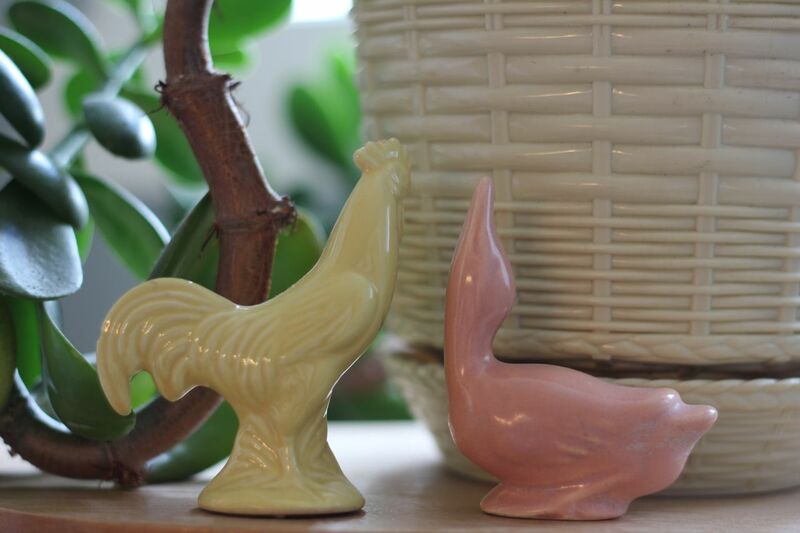 I have a lot of fun Easter decorations, but this year got away from me, so I just put out a few spring things. These little cuties are my favorite. I love their simple monochromatic style and soft, vintage colors. I usually pick them up at thrift stores for under a dollar, and I keep an eye out for them whenever I am poking around the shops. In recognition of Valentine’s Day, the diamond company, Brilliant Earth, recently contacted select bloggers inspiring us to form our own unique expression of love to share with others. Brilliant Earth is a company committed to providing ethically sourced diamond wedding and engagement rings. I can’t think of any more important piece of jewelry in my life than my wedding ring. Is it a conflict free diamond? I don’t actually know where it came from, as it was given to me as a family heirloom once belonging to my husband’s grandmother. That is my favorite kind of jewelry actually, pieces with a story – handed down and passed along. It’s the ultimate form of being green, don’t you think? Without a doubt, I have lots of jewelry pieces tucked away. Many are sentimental for the memory attached to it or the person from whom it was given. I’ve been gathering hearts for a few years now with the intention of making something special for Valentine’s Day, and this seemed like the perfect time to create a collage full of my “memory jewels.” I see a heart from Grandma’s pin, and a lone earring, given to me by my best friend in the first grade (the other one long since lost). I see pendants from necklaces I once wore (and some given to me by a former beau or two.) It’s a story of the many people whom I have loved – and I love it! Well, like much of the country this winter, Montana has finally had its turn at frigid cold temperatures. Last week was especially freezing, and most of the kids at school were crossing their fingers for a school closure. No such luck. After all, it’s winter, and it’s Montana. “Bundle up, and buck up!” is the attitude of most. When it get so cold that your nostrils freeze, and the dogs poke their noses outside and retreat, I always think of my sweet Grandma. 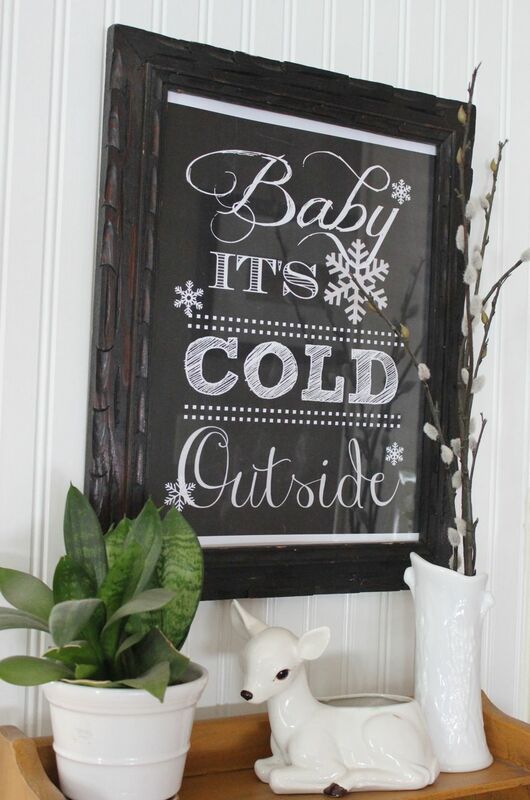 “Baby, it’s cold outside!” she would always say. I wanted to do a little winter decorating to cheer things up after taking down the holiday decorations. 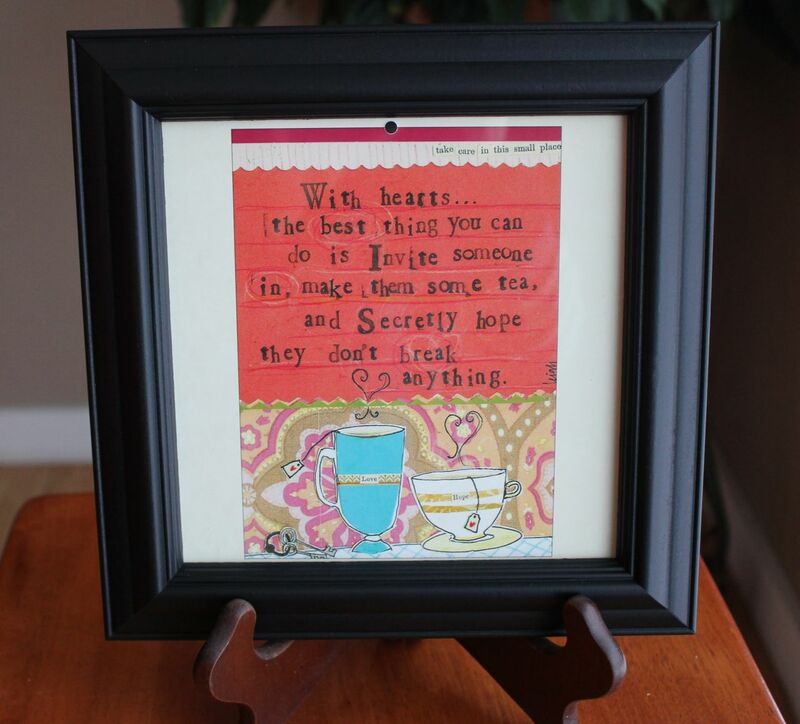 My inspiration, as well as the free chalkboard printable, came from Barb at The Everyday Home blog. Many thanks to her for her inspirational post as well as her cheerful artwork! 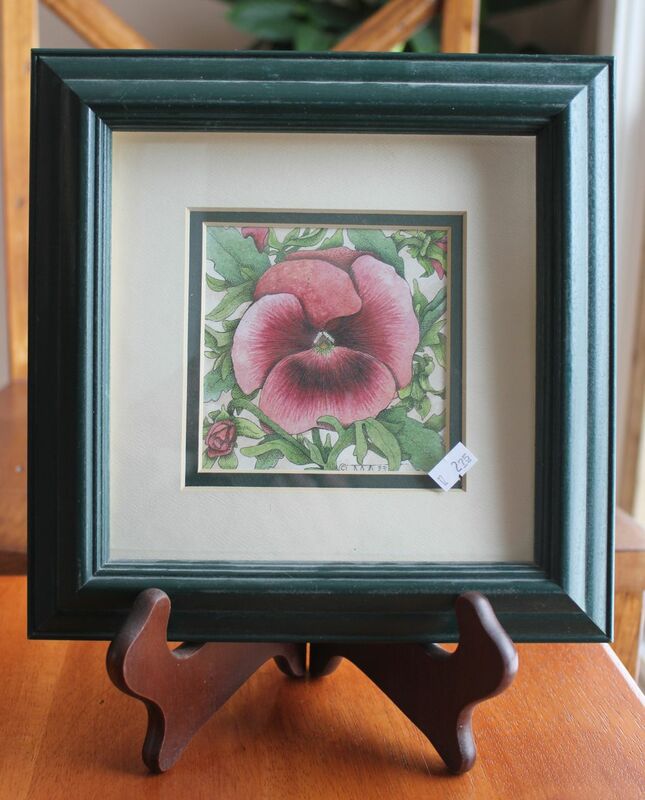 A thrift store frame brings it all together. Here’s to spending time in the crisp Montana outdoors and snuggling up by the fireplace afterward. It truly is the best of both worlds, isn’t it? Happy Crafting and Happy Winter! One of my favorite things about the new year is putting up a fresh, new calendar. My favorite calendar for the past few years is without a doubt the Curly Girl calendar. I treat myself to a large one for my home office, a small one for work, and a couple to give as gifts! Leigh Standley is a talented artist, and she makes me look forward to turning the page of my calendar each month. (Sometimes I even turn the page a day early just to peek!) I love their whimsy, their wisdom, and their their inspiration. The problem is that they are so lovely that I can’t bear to discard them at the end of the year. So, I decided to come up with a way to enjoy my favorite calendar pages all throughout the year! First, I measured the picture pages from an old calendar. I used a smaller calendar, and they measure 7″X 7″. This isn’t a very standard size, so I couldn’t find any frames at any major retail stores. I did find some online, but they were $15-$20 each, and of course, there’s always shipping. So, I did what I always do…. I went to the thrift store. I found an old Pier One picture that was in great condition, and the price was right. I took it apart, spray painted it (this one was green), and I had a great piece of art for under $5.00! AFTER: Now, I can switch out my favorite Curly Girl calendar pages when the mood strikes. What a great way to usher in a new month – and new year! Happy New Year, and Happy Crafting! Read more at http://www.brainyquote.com/quotes/keywords/calendar.html#umz17Oq73rJL0pFL.99I value the friend who for me finds time on his calendar, but I cherish the friend who for me does not consult his calendar. 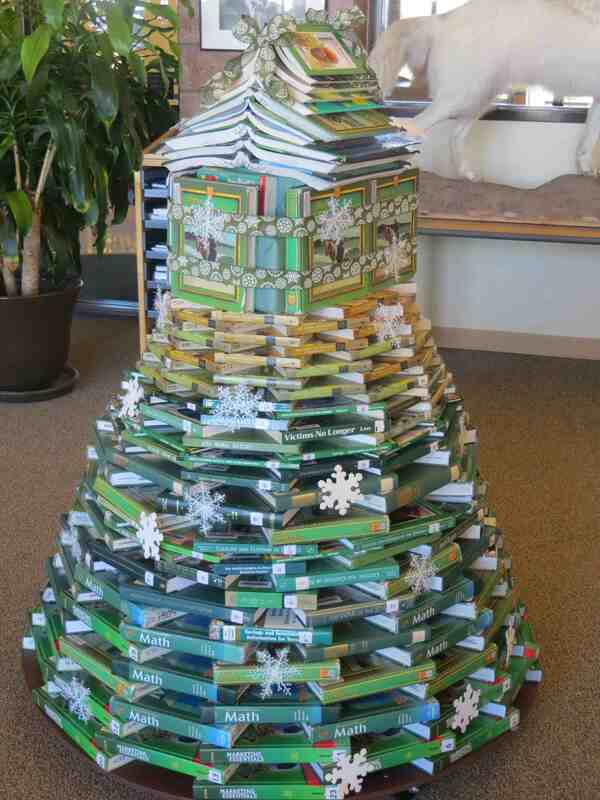 May your Christmas holiday be filled with hours of uninterrupted reading time and LOTS of good books! 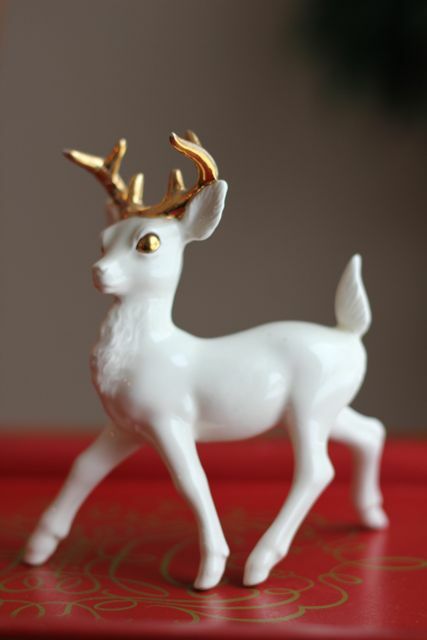 Oh Deer, Christmas is Here! Sometimes I find some wonderful treasures at the thrift store to make it an extra merry Christmas. I thought I would share a few of my recent finds. 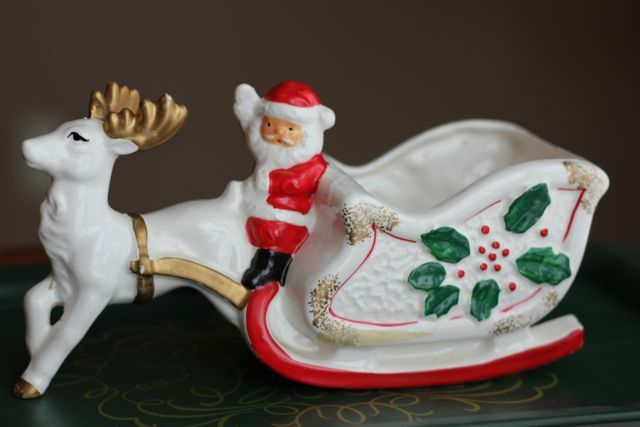 No markings on this piece, so it’s probably homemade– Which makes it even more special! 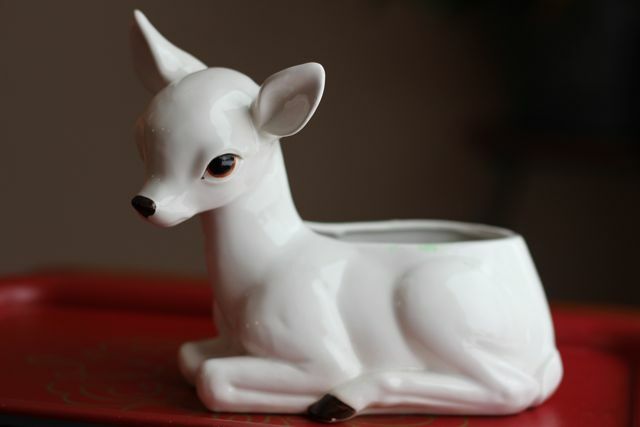 A lovely vintage Napco planter. Merry Christmas and Merry Thrifting! 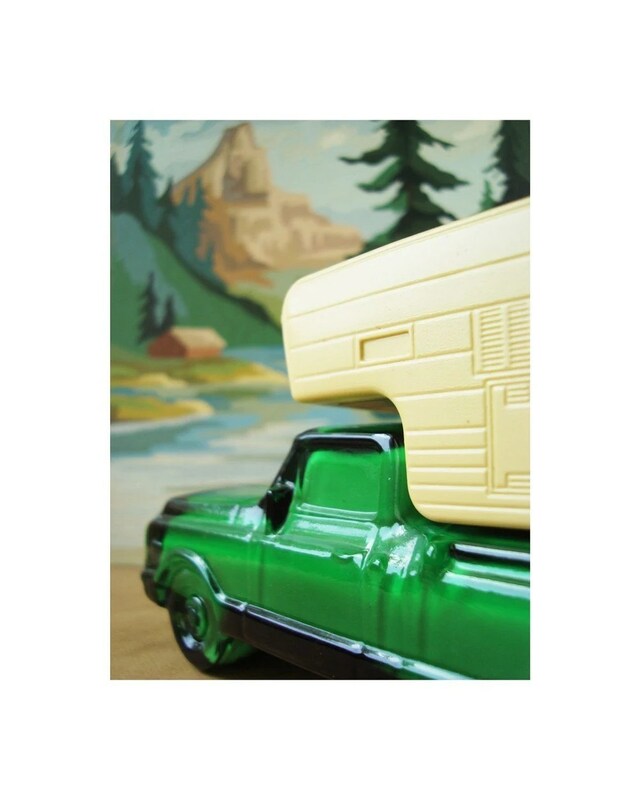 I’m loving by the photos for sale in the Etsy shop doe-c-doe. First of all, I’m a little obsessed by old Paint-by-Numbers pictures. I’ve been snagging them at thrift stores and consignment shops lately, and I think they’re just peachy! I hit a garage sale last a couple of weeks ago and found a vintage kit with the print still in the box – untouched. (I’ve got big plans for sitting down with that bad-boy this winter and trying my hand at a little long-forgotten craft skill.) 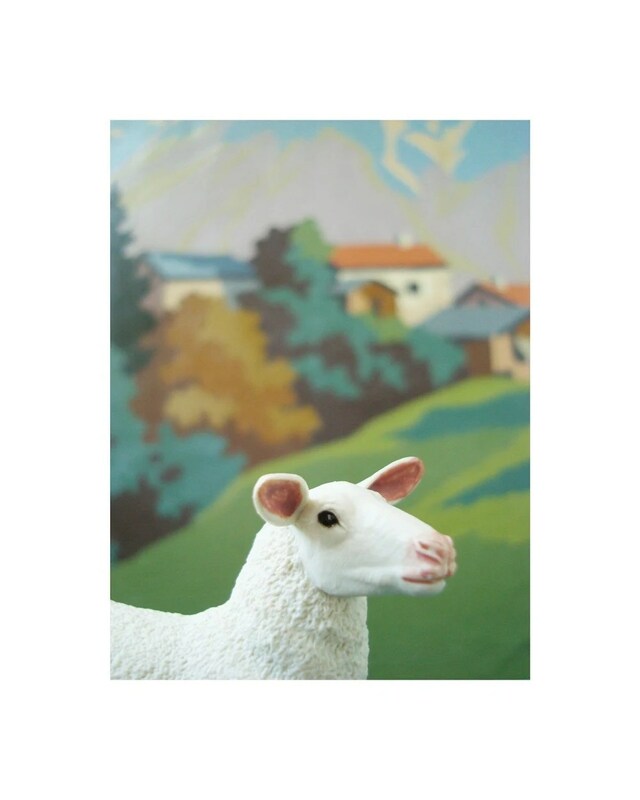 Here are three of the kitchy-cute pieces of photography available from doe-c-doe. Adorable, don’t you agree? Perhaps I’ll get all three! Recently, I became sad about all of the beautiful pottery I have collected that has been sitting in boxes since my last move (six years ago!) 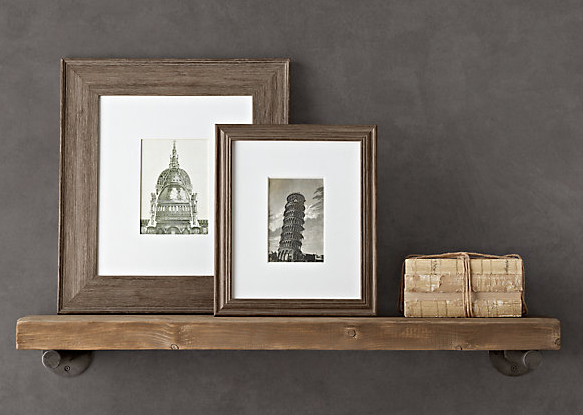 I desperately needed some shelves to display my collection, and for some reason, this look from Restoration Hardware really caught my eye. However, the price was out of my budget. 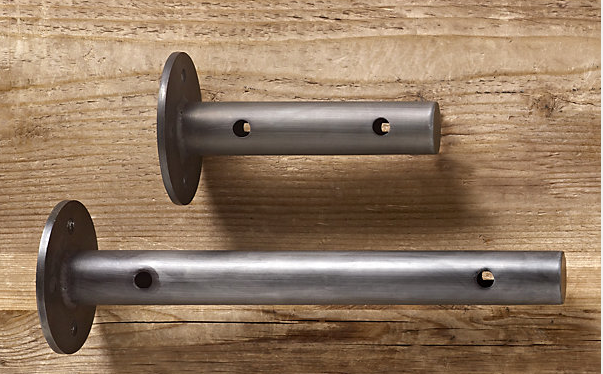 So, I headed to the hardware store, and came up with a similar design that looks fantastic in my bedroom and didn’t cost an arm and a leg! 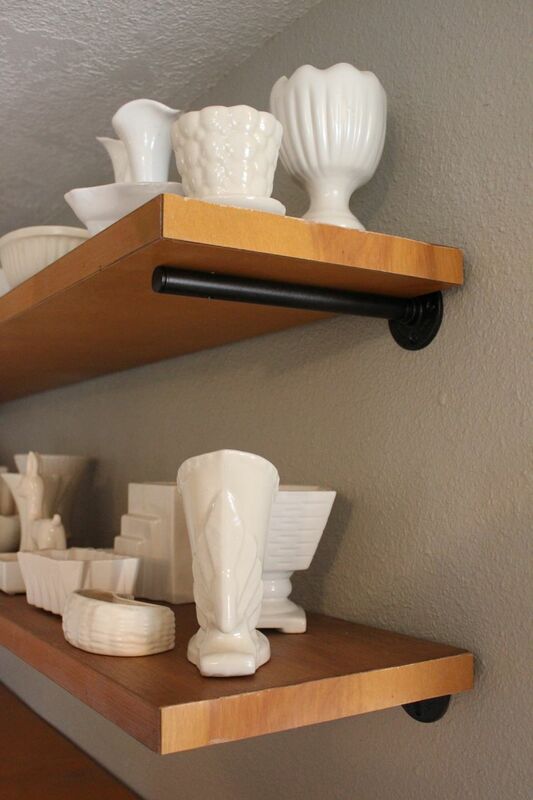 Now I am enjoying my pottery, and also realizing that I probably shouldn’t buy any more because these shelves are FULL. Here are the versions from RH. Aren’t they beautiful? And here’s what I came up with…. 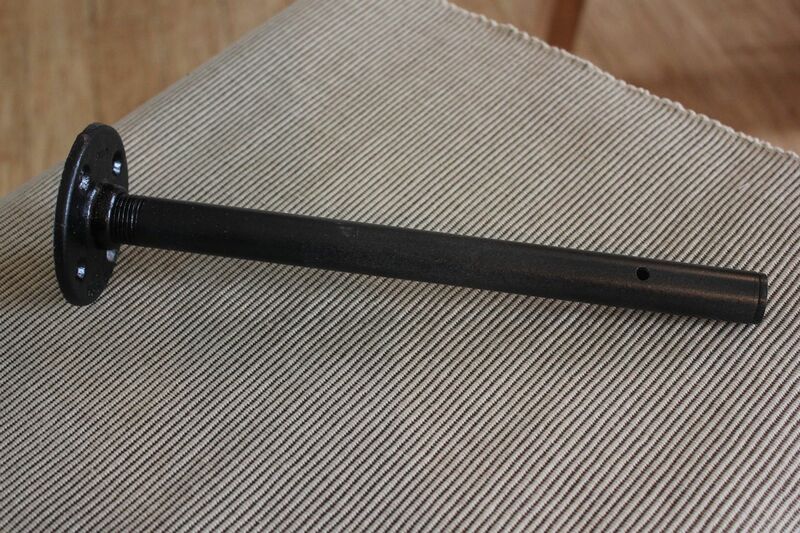 First, I bought some galvanized steel pipe with a threaded end. I think they came in one foot lengths. 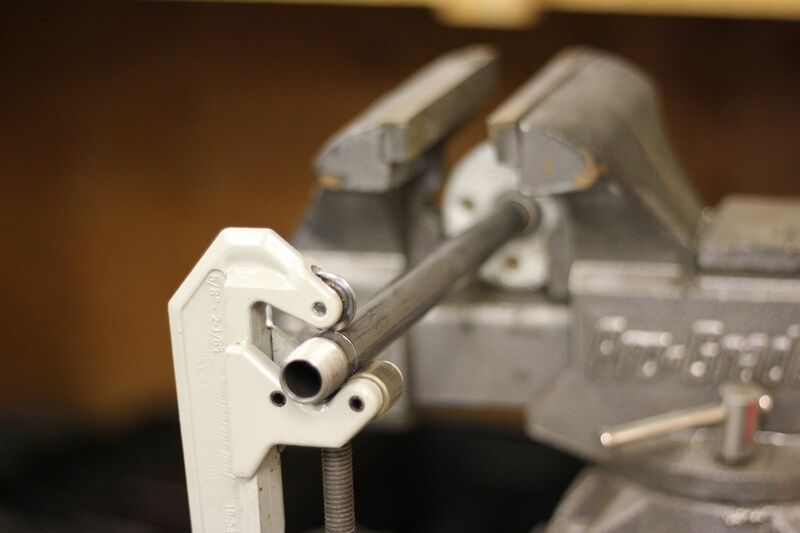 I used a pipe cutter to trim each end to length. It took a little while, but it wasn’t too bad. I cleaned each of the pipes really well with some de-greaser. Then I added a floor flange and a black plastic plug (these are in the isle next to all of the pipe.) 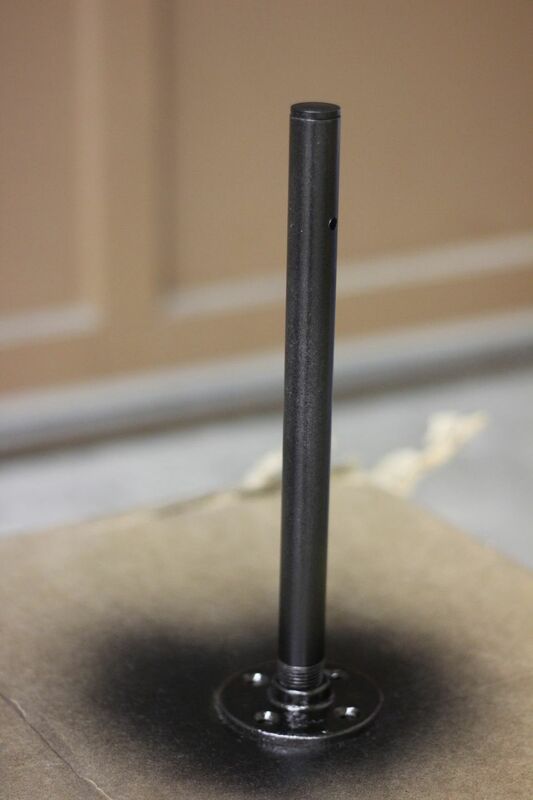 I spray painted them an oil-rubbed bronze color. 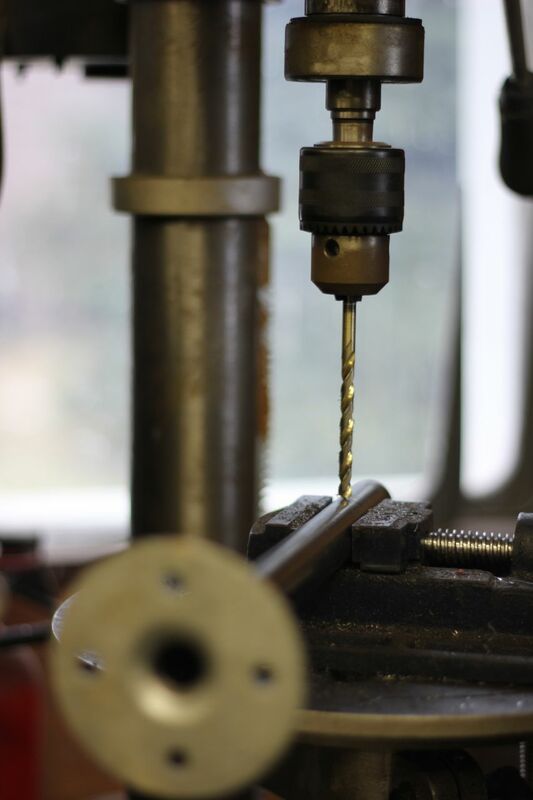 Then I put them in the drill press and added holes so I can attach the brackets securely to the shelf. Here’s how they turned out. I think they look very similar to the more expensive ones from RH, don’t you? My shelves are actually re-purposed bi-fold closet doors from our Habitat for Humanity Resale store. I removed the brackets, cleaned them up, and added a couple of coats of clear satin spray paint for protection. 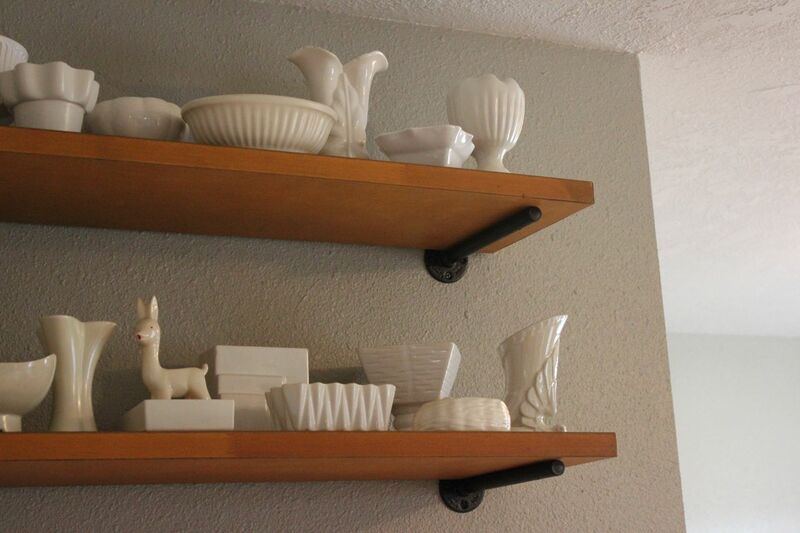 Now I can enjoy all of my vintage pieces of pottery…. Really, I have enough! 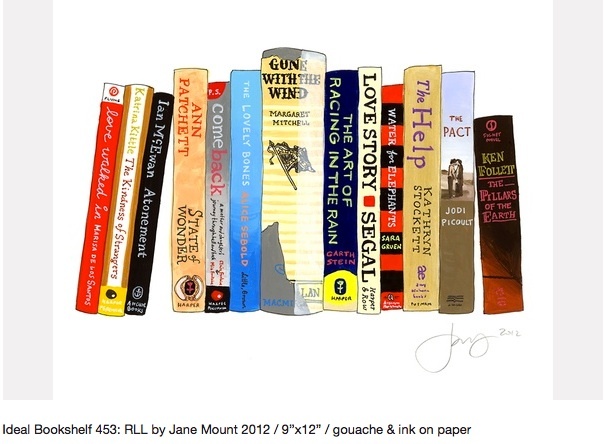 Lately, I have become enamored by the ideal bookshelf artwork of Jane Mount. I stumbled upon her website on a Pinterest binge and suddenly became obsessed with trying to decide what books would go on my ideal bookshelf! I love the slightly whimsical quality of the paintings, and I could browse the site for hours admiring the “shelves” that have been created for others. I’m thinking I would want to choose books that had important meaning in my life, but of course, I would try to avoid being a book snob and choosing books simply to impress others. I mean, most folks would know that War and Peace wasn’t really one of my favorite books! 1. Where the Lilies Bloom (Cleaver): I read this book numerous times in my childhood and was enthralled by the way a group of siblings took care of themselves after their parents died. 2. The Master Butchers Singing Club (Erdrich): I can’t remember many books that draw me in the way this one did. When it ended, I felt sad that my time with the characters was over. 3. Autobiography of a Face (Grealy): This sad story was written with such honesty and some of the most beautifully crafted language I’ve read. 4. A Thousand Splendid Suns (Hosseini): One of the most moving friendship stories I can remember. This book touched me deeply. Oh, it’s so hard to pick, but I’m going to keep brainstorming. I just worry that there will be too many books on my shelf! I really look forward to having one created just for me, and I think I know exactly where it will go! Happy reading!